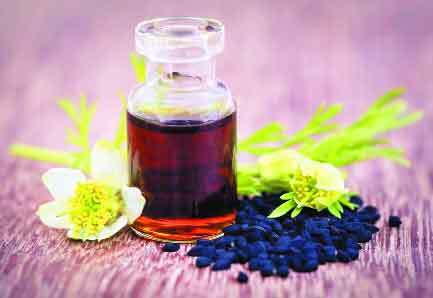 Black seed oil, popularly known as kalonji oil is extracted from nigella sativa plant, native to India. It is a medicinal plant and according to Ayurveda, people have been using black seed oil and seeds to prepare medicines and herbal concoctions. It has anti-inflammatory, antioxidant, anti-microbial, anticancer and immune-enhancing properties. Kalonji seeds are used in Middle East countries as a spice. They add it to pastries, dairy products, salads and other foods. Since ancient time, black seed oil has been applied topically and taken internally for any ailment, bruises, hair, cold, snake bites, headaches, indigestion, and a variety of skin problems. It has also been used for “pink eye” (conjunctivitis), pockets of infection (abscesses), and parasites. It’s a remedy for asthma, diabetes and hypertension. Black seed oil has an unusual ability to fight bacterial infections, even drug-resistant ones such as Methicillin-resistant Staphylococcus aureus (MRSA). It is one of the rare natural oils with strong anti-microbial benefits. It helps to heal minor cuts and prevents formation of scars. Numerous studies have been conducted on people suffering from allergies and eczema and black seed oil relieved both allergies and eczema. Effective dosage depends from person to person as per body weight. It has miraculous conditioning, nurturing and healing benefits for skin and scalp. Kalonji powder is a stimulant and added to skin care products to detoxify, deep cleanse and nourish the skin. Reduces swollen joints and morning stiffness in women suffering from rheumatoid arthritis. The disease is an auto-immune reaction, and the oil helps modulate the immune system. Black seed oil can relieve dyspepsia, a combination of symptoms that can include indigestion and/or heartburn. Black seed oil has less calories and saturated fats in comparison to other oils. It lowers cholesterol in adults when substituted to other oils and butters. A word of caution: black seed oil can turn rancid and should be stored in a cool place, in a dark-colored bottle. The usual dose is one tablespoon daily.